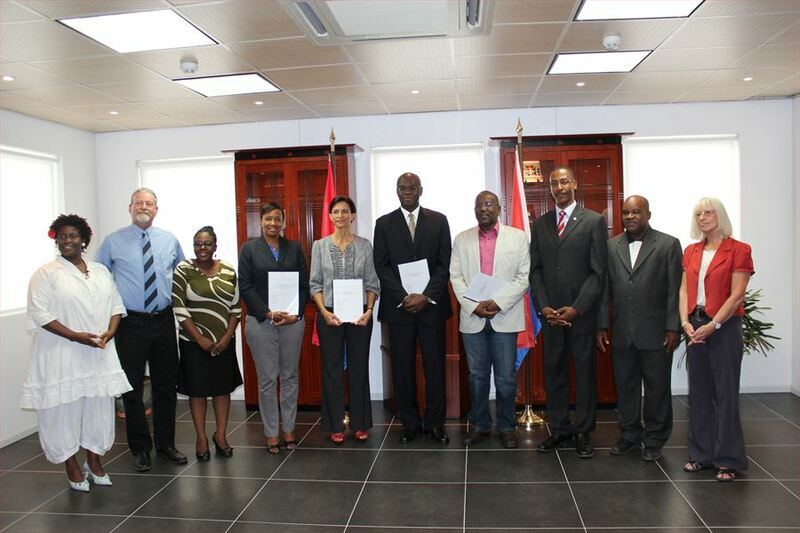 Harbour View –The Report of Recommendations of the Governor’s Symposium 2012 on the topic National Heritage; Historic, Cultural and Economic Importance was presented by the Organizing Committee to Governor Eugene B. Holiday, Prime Minister Sarah Wescot-Williams, Deputy Prime-Minister William Marlin and Minister of Education, Culture, Sports and Youth Silveria Jacobs at the Governor’s Cabinet on March 8, 2013. The organizing committee is comprised of Members: Paul Middelberg (Chairman), Cedric Peterson (Act chairman) Neville York (Secretary), Elsje Bosch, Marcellia Henry, and Permanent advisors to the Committee: Jay Haviser, Astrid Plantz, Clara Reyes, and Reuben Thompson. The purpose of the Governor’s Symposium 2012 was to place the National Heritage of Sint Maarten – tangible and intangible – in the spotlight as a nation building initiative by highlighting Sint Maarten’s national heritage and drawing from various experiences to emphasize the benefits of the restoration and preservation of national heritage. The Committee’s report of recommendations is the result of the committee’s review of the presentations delivered. The lessons drawn have been summarized in 7 focus areas and captured in 16 concrete recommendations for consideration by all stakeholders including government. The 7 focus areas include: (a) establishing a monument council, (b) national heritage education (c) maintenance and preservation of national heritage; (d) investing in national heritage facilities; (e) introducing public information campaign; (f)fostering community responsibility; and (g) organizing funding. Governor Holiday thanked the members and permanent advisers of the organizing committee for accepting the tasks to organize the symposium and for their time and dedication in making it a success. “As I said at opening of the Symposium on December 17th last, it is my belief that in the Governance of our country heritage matters. It is my hope therefore that the lessons drawn from the symposium and outlined in this report of recommendations by the committee will if implemented contribute to a stronger embrace of our National Heritage as a unifying force and as a driver for our common future as we continue to build and develop our nation. I trust that the recommendations will be well received, considered and adopted in national development policies of our country” Governor Holiday stated. Prime Minister Wescot-Williams, Deputy Prime-Minister William Marlin and Minister of Education, Culture, Sports and Youth Jacobs all also thanked and congratulated the Committee for their work. Minister Marlin stated that he is confident that the contribution of the committee will be of benefit to the government and the people of Sint Maarten.